Quick overview Jennifer Roberts introduces the background and writing of the 5th century Greek thinker and researcher Herodotus of Halicarnassus, who invented the genre of historical investigation. She discusses all aspects of his work, including his fascination with his origins; his travels; his interest in seeing the world; and the recurring themes of his work. Herodotus has come to be respected by most scholars as a responsible and important historian. Herodotus was both a critical thinker and a lively storyteller, a traveller who was both tourist and anthropologist. Like Homer, he set out to memorialize great deeds in words; more narrowly, he determined to discover the causes of the wars between Greece and Persia and to explain them to his fellow Greeks. In his hands, the Greeks' unforeseeable defeat of the Persian kings Darius and Xerxes, with their vast hosts, made for fascinating storytelling. Influenced by the work of the natural scientists and philosophers of his own and earlier eras, Herodotus also brought his literary talents to bear on a vast, unruly mass of information gathered from many interviews throughout his travels and left behind him the longest work that had ever been written in Greek - the first work of history, and one which continues to be read with enjoyment today. 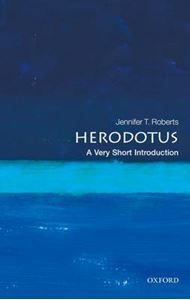 Herodotus: A Very Short Introduction introduces readers to what little is known of Herodotus's life and goes on to discuss all aspects of his work, including his fascination with his origins; his travels; his view of the world in relation to boundaries and their transgressions; and his interest in seeing the world and learning about non-Greek civilizations. We also explore the recurring themes of his work, his beliefs in dreams, oracles, and omens, the prominence of women in his work, and his account of the battles of the Persian Wars. ABOUT THE SERIES: The Very Short Introductions series from Oxford University Press contains hundreds of titles in almost every subject area. These pocket-sized books are the perfect way to get ahead in a new subject quickly. Our expert authors combine facts, analysis, perspective, new ideas, and enthusiasm to make interesting and challenging topics highly readable.